Medium gold color. Fresh, sweet aromas of banana taffy, dried pineapple, woodruff, and hay with a silky, crisp, dry-yet-fruity light-to-medium body and a tingling, interesting, brisk caramel coated nuts, candied ginger, chamomile, and lemon rind and clove finish. A friendly and likable whiskey full of all-American sweet and spice. Bottom Line: A friendly and likable whiskey full of all-American sweet and spice. 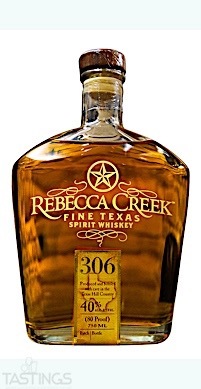 85 • Rebecca Creek Fine Texas Spirit Whiskey 40% (USA) $31.99. The legal definition of a spirit whiskey is one that is a mixture of neutral spirits and not less than 5% on a proof gallon basis of whiskey. 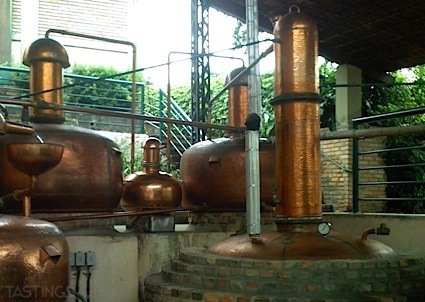 While this category has been defined for some time, the production of spirit whiskey in the United States is a fairly new development. These products are not blended whiskeys (whiskeys of different types), but rather whiskey (aged in charred oak barrels for at least two years) blended with other spirits, such as vodka. Styles vary, with some being clear and others having an amber color. These are primarily meant for cocktails, while a few of the finest artisan examples are ideal served neat or over ice. Rebecca Creek Fine Texas Spirit Whiskey rating was calculated by tastings.com to be 85 points out of 100 on 8/24/2017. Please note that MSRP may have changed since the date of our review.